Bonheiden was my last overseas trip for 2018. Askeaton joined Kvint and Emma as the five year olds was 1.10 and I thought the lovely Belgian courses on a really good surface would be a good end to the season for her. Becky Forte came to help me and we set off at 4.30 on Wednesday morning. I haven’t been to Bonheiden before, but it’s just 3 hours from Calais, is the first show I’ve found without getting lost once, and when we got there the horses had lovely permanent stables, with automatic water drinkers: I’m sure I’ll be back. The horses trotted up first thing on Thursday and Askeaton jumped at about 10.30. She is the most incredible five year old. The warm up was in a permanent tent, and it was busy - she didn’t mind a thing and then she went into the very spooky, grown up ring and jumped as if she’d been there all her life. Kvint then jumped a super round in the 1.30 for a low placing, and I exercised Emma so we were off to a good start. On Friday Askeaton jumped early. Unfortunately the girl before me fell off and took the bridle with her so the horse careered round the ring before running out into the bar where Becky caught her. Poor Askeaton, given that she was only broken in December, and was very nervous and wary, we did have a few anxious moments, and she was very green over the first few fences, but then relaxed and jumped really well again. Emma then jumped the 1.40 speed class which was a qualifier for the ranking class on Saturday and the Grand Prix. She felt very fresh, and jumped a fabulous round to finish 11th. It was important to try to qualify and to jump clear so I didn’t hurry her, but her cruising speed is naturally quick and actually there were very few clears. Kvint then jumped brilliantly in the 1.30, which had over a hundred in it, so it was very strong, and he was actually very quick, but I got a rush of blood to the head and had a bit of a wild stride to the third last resulting in him having the back bar - I was furious with myself for letting him down. On Saturday I just had the five year old final with Askeaton, and the ranking class, the Small Grand Prix, with Emma. Askeaton was 8th to go which is always a little bit hard, and the course was much bigger than she is used to, finishing up a proper 1.20. She jumped beautifully, and I was thrilled with how much she had learnt over the three rounds. In this round she landed on the right leg, or changed immediately every time and was so good to ride to every fence. The video below shows her progression through the three days. I think she is quite exceptional, and just so lovely to ride. I had a long wait to jump Emma in the 1.45 ranking class. When I walked the course I thought it was big and very technical, with a difficult combination away from the collecting ring at fence 4, with a dog-leg distance after it to a big oxer and then a difficult double. Unfortunately the person before me managed to make the combination look quite impossible and very long. Emma jumped the first three fences quite beautifully and I then overrode into the combination making it exceptionally short! She landed running and I was flustered so I added to the next fence and then overrode again to the double, so decided to retire. In retrospect, having watched the video and had a sensible conversation with David, it didn’t look too bad at all and she was jumping very well. But we have jumped very few ranking classes, and this was a big course in a smaller ring and there was absolutely no room for error. Back to the drawing board, more practice and a bit more support and I really think we will crack this. It is amazing what a big step up every 5cm is. On Sunday I just had Kvint and Emma in the 1.35. With over 120 in the class it was as strong and technical as it could be. Kvint was 5th to go and jumped brilliantly. He had two down in the jump-off, but was flying and when I looked at the course after we had jumped I couldn’t believe how big the fences looked. Usually once you have jumped round the fences look much smaller! I then set off on Emma, knowing that the combination would be tricky for her, and managed to ride her exceptionally badly so that we had a fence down before the combination! She actually jumped the combination brilliantly, but she certainly found it difficult. I was thrilled with the horses and it was a good note to end on for the season. I wish I had ridden Emma better, but looking back over the year I started the season being so worried about Emma’s health, and concerned about travelling with her, etc and actually she has jumped brilliantly and been placed in almost all her 1.40 classes. She was 6th in a red hot 1.30 national final and had good placings in her last two international shows. My self-belief when riding Emma has been rather inconsistent this year. I think I am riding better and that my ability to understand the technical aspects of the bigger courses has improved, but sometimes my lack of experience and confidence can be a massive obstacle. Kvint has been absolutely fantastic this year. 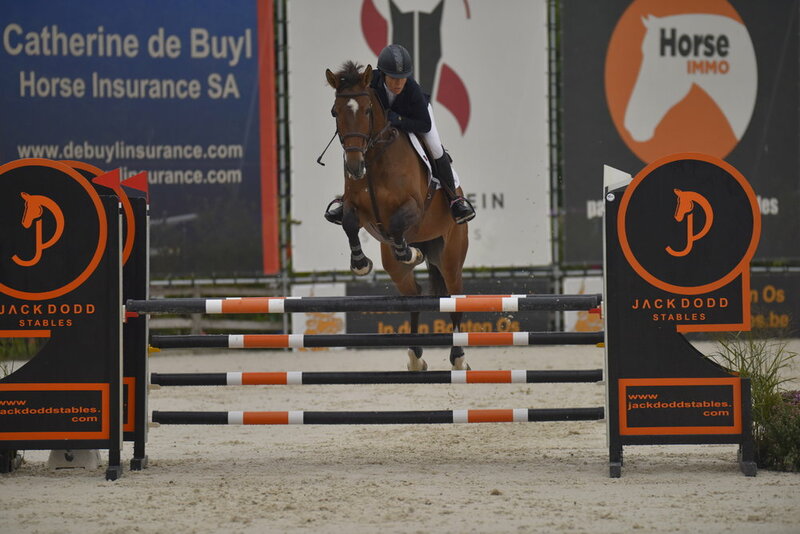 He only stepped up to 1.30 in Lier in March, and has been so consistent at this level and has jumped his first Grand Prix and his first few bigger classes so well. He is the easiest, most charming horse and I couldn’t be more thrilled with him, and I have so much confidence in him now. Askeaton has gone from being broken in December to jumping at her first international show in September. She is a little star! Heidi has also come on so well. They are all in the field now. The three young horses, Askeaton, Heidi and Riri, are in a beautiful field up on Ashdown Forest, and they are getting fat and woolly, and look really switched off and relaxed. For the youngsters I think getting them right away for their holidays really helps. Then they know that this is where they work, and when they are away they can relax and be horses. Emma and Kvint have had their back shoes off and are turned out together. They look really relaxed and aren’t getting too fat, but they are certainly woolly. They will have four weeks off in total and then it will be back to work for all of us. One of the lovely things about stay away shows is the opportunity to get to know some of my fellow competitors better and in Bonheiden we were lucky enough to get to know Australian eventing olympian Chris Burton, and his lovely wife Beck and little son Harry and also Paul and Denise Bevan. Needless to say I managed about two days of not riding before I was itching to ride something, so I have been helping out with some of the riding at Breen Equestrian. I have been riding some lovely young horses, and have developed a very soft spot for a five year daughter of the great Magic Fox and Balloon. I will certainly be watching her future with great interest - she is a really special one. Meanwhile we are doing those end of year jobs, Steff, Camilla, Izzy, Mark and I are painting the stables, and the lorry has been off to have all the little niggles mended and checked, and to have it’s yearly major service. The horses are having a fabulous break in this lovely Autumn weather and we will all be keen to get going in December. We have Sophie and Alex’s wedding to be very excited about in November and a special birthday treat for Mark in December. Of course nothing would get done without a fabulous team pulling it all together. Becky did a sterling job in Bonheiden. We had very early and very cold mornings, and some very late evenings, and it was lovely to have such great company, especially on the journey. The reason I didn’t get lost is Becky was so good at reading the instructions and looking out for the rather tiny show signs. At home Steff, Camilla, Izzy and Mark kept everything going. Many thanks also to my sponsors, Saracen Horse Feeds, Just Equine Ltd, and Macwet Gloves and for the help I get from Bombers Bits, Horse Pilot and Fabbri Boots - life would be very much harder with out all of you. Becky Forte and I set off for Jardy with Emma and Kvint on Wednesday, 13th September. We had to go on the Eurotunnel as it was an incredibly windy day. We eventually found our way off the Paris Peripherique and after anxious telephone calls to Bumble Thomas and the show, and driving over a lot of speed bumps in the woods, I managed to find a lady in her garden who gave me directions to the show. We unloaded in the absolutely pouring rain, and were soaked to the skin by the time we had set up. We were so wet that we didn't even mind taking the horses for a graze in the rain. Luckily Thursday morning was dry and Bumble Thomas and I went for two lovely hacks round the woods and past the very beautiful houses before trotting the horses up on some very bumpy concrete. Certainly I was extremely unsound on the uneven ground, but the horses both seemed to cope with it. Without the horrible rain we were able to see what a beautiful place Haras de Jardy is. It was built in 1890 as a thoroughbred stud and is now owned by the state. On Friday morning I jumped Kvint in the 1.20. I thought he might be spooky in the beautiful ring with bright jumps and a big stand, but he wasn't at all impressed by anything, especially not me! He was a little bit over bold and rather strong, having two fences down. Emma jumped brilliantly in the 1.30 two phase to finish in my usual position - one place out of the money. On Saturday I jumped both horses in the 1.30 speed. Emma jumped beautifully for a minor placing, and Kvint just had the first fence and going into the last double when there was a dog in the way. He felt really good and super scopey, so I am really looking forward to doing some bigger classes with him now. Saturday was a very good day for the Brits with wins in four out of five classes, Alice Watson, Adam Botham and Declan Irvine all winning classes and Bumble Thomas and Tracy Newman getting good places. On Sunday Kvint jumped a super double clear in the 1.25 and then it was Emma's turn for the 1* Grand Prix. I was right at the end of the class and she jumped a fabulous round to be one of seven in the jump-off. Last to go in the jump-off I went faster than usual, but still not as fast as a French person, to finish 4th. Although it wasn't a huge course it was difficult enough, and certainly the first time I have won 500 Euro. We also got a lovely blue plaque for the stables. The jump-off was fantastic fun. Emma jumped so well, and it was lovely to have such great support from Becky, Bumble and Sean Brady. Once again the Brits did really well with Alice Watson also placed in the 1* Grand Prix, and Graham Babes winning the 2* with Adam placed again and Bumble placed in the final class of the show. As always foreign shows are great for making friends and enjoying compatriot support. Becky and I then packed up and set off, just in time, as we drove through unbelievable rain. Once again I think we saw quite a lot more of Paris than was strictly necessary on the way home, but we made good time to be in Calais while it was still light, and were home at 12.30. A long, long day, but at least a very happy drive home. 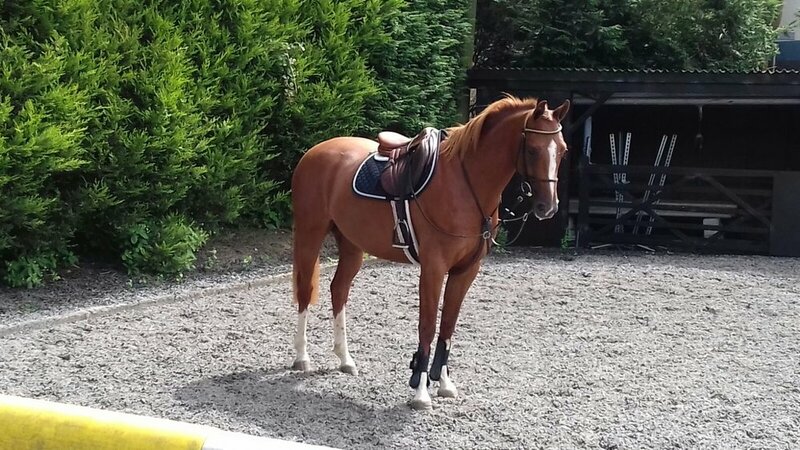 I was up early on Monday to do the yard before going to Max Routledge to ride and collect my new purchase - three year old Heidi, one of Max's homebreds out of Tiandra, who was jumped successfully by both Max and Kathy Willard and by Max's lovely stallion Typhoon S. So far, so good, I am absolutely thrilled with her. She has settled in really well, been for two hacks and been in the school today. She is very orange and very little, but the last little three year old I bought was Emma, and I think this one feels very exciting. I spent a rather sad Monday afternoon celebrating the life of Sara Brise, who recently died in a horrible accident. The huge number of people who gathered for her wake and to support her family were a good indication of what a very popular and respected lady Sara was. There were lovely tributes paid and her daughter Sophie managed to sing quite beautifully for which I have great admiration and respect. As always many thanks to Steff and Mark, for keeping everything running while I was away and to Becky Forte who did a brilliant job of looking after the horses, and me, and keeping me company on the drive. I had a great lesson with Shane on the Tuesday morning after Auvers. Emma jumped really well, and Shane made me actually ride her rather than me letting her take charge. Shane is very clever at very quickly pinpointing where I have gone wrong and making me get a grip and ride properly. With renewed confidence I jumped Emma in the 1.30 on Thursday. She worked in really well, and jumped a great round to finish 7th. On a very misty Friday morning I jumped Kvint in the 1.20. He jumped really well, but had a massive shy when the course-builder moved as I came to the gate and just had four faults. Luckily I had both Becky Forte and Issy Gurney helping me on Friday - a bit spoilt and luxurious - but Kvint is a bit naughty on the lorry on his own, and so Issy was a super star and kept an eye on him while Becky helped me warm Emma up for the 1.40 in the main ring. Emma had her best round at this level at Hickstead yet, just having four faults when I rode badly into a double and having the middle of the combination. After consultation with Shane, who was in Gijon, I had a full run down how my lack of a plan had impacted on my round. We decided to go for the Grand Prix on Sunday and to ask Trevor to walk the course with me. On Saturday I just took Kvint to jump in the 1.20. He was an absolute star and I was a geriatric fool. I got completely lost in the jump-off - managing to get 14 time faults while I looked for the third fence, which completely scuppered Kvint's chances of going in the main ring! Bearing this in mind I walked the course very carefully on Sunday and Kvint jumped a great clear round to get placed in the 1.20. This also gave me something to concentrate on rather than panicking about the Grand Prix. I walked the course with Trevor who was tremendously helpful, especially about how to ride the slope in the ring itself. The course was huge and technical and I couldn't really believe it was possible. We started off really well, Emma was fantastic, and then got in a little bit of a muddle to the gate and the water, so I pulled her up, got ourselves back together, and she jumped the last four fences home absolutely perfectly. Even with a score that the All Blacks would be proud of I was absolutely thrilled with Emma and even a little bit proud of myself. I never thought we would ever attempt a course like that, and actually she literally soared over the fences. So I just have to pull myself together and make myself ride properly all the time and really do her justice. Having given the horses a very well deserved couple of days in the field and then worked them quietly last week, the had a jump on Saturday and I then had a lesson with Shane on Monday where they both jumped really well. Emma particularly was very fresh and enthusiastic. Becky Forte and I are off at the crack of dawn tomorrow to Jardy near Paris. With the weather forecast I am pleased to be doing the CSI1* on both horses. I am entered for a couple of 2* shows with Emma in October, but a bit of consolidation will be a very good thing, and she is not enthusiastic about very wet ground. It will be good for Kvint to have another stay away show before we try to step up to 1.30. On the home front we have now got a couple of new additions to the yard. Sarah Travis is keeping her lovely four year old Sooty with us, and we also have Elena Walker keeping her beautiful pony, Lyra, with us, so the yard is getting nice and busy for the winter.